In 2011, The Asia-Pacific Journal: Japan Focus published the first detailed research into the usage of U.S. military defoliants, including Agent Orange, on Okinawa.1 Six years later, official documents, photographs and testimonies from hundreds of veterans suggest Vietnam War defoliants were stored, sprayed and buried throughout the island. However because the Pentagon denies that defoliants were ever present on Okinawa, many more veterans have been refused support from the VA.
Now new evidence has emerged on the usage of defoliants on Okinawa: interviews with the veterans who inventoried them at Kadena Air Base, indications that missing supplies of Agent Pink, a defoliant more toxic than Agent Orange, ended up on the island and the case of a U.S. Airman whose death in 2014 suggests that dioxin contamination remains a threat to Okinawa today. During the Vietnam War, Kadena Air Base was one of the busiest airports on the planet as an estimated one million military flights shuttled troops and supplies to the conflict.5 Such a massive operation required a well organized logistical workforce; two of those involved were Allan Davis and his future wife, Eileen. 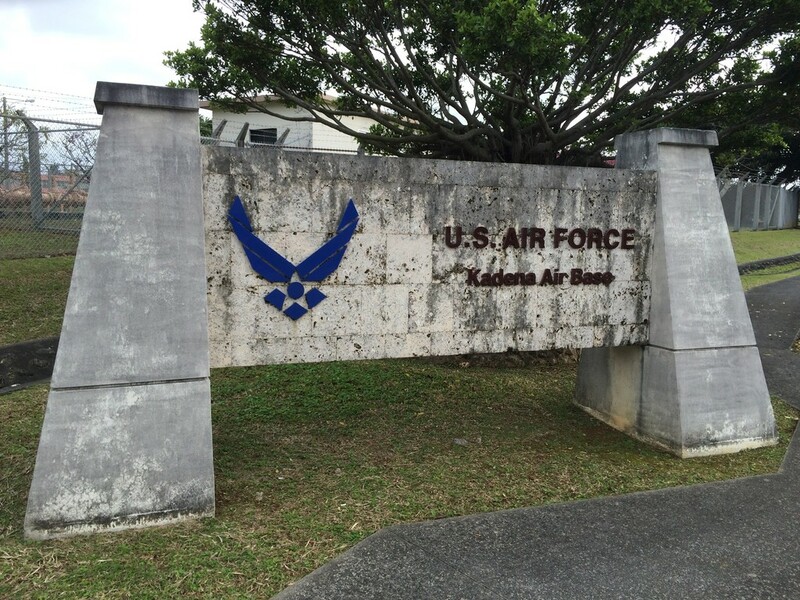 Allan was stationed at Kadena with the 824th Supply Squadron from 1968 to 1971. Eileen, a USAF computer specialist, worked at Kadena Air Base between 1969 and 1971; her duties involved making records of all assets on the installation, including Agent Orange. Today both husband and wife are sick with illnesses they believe were caused by Agent Orange; Eileen suffered a miscarriage, their surviving son was born with a birth defect and she required a hysterectomy at the age of 25. Kadena Air Base has a history of contamination stretching back decades. Jon Mitchell. Other veterans were exposed there, too. According to VA records, a U.S. Marine truck driver who transported barrels of Agent Orange from Okinawa’s ports for storage at Kadena Air Base between 1967 and ’68, developed prostate cancer as a result of his exposure. The VA awarded him compensation in 2013. However, the Davis’s are facing an uphill struggle to receive similar assistance because, according to VA regulations, prior decisions do not set a precedent for other cases. So just how many veterans have claimed they are sick from Agent Orange exposure on Okinawa? The VA says it doesn’t keep records. But the Board of Veterans Appeals maintains a publicly-accessible database of rulings. Detailed searches reveal that at least 250 service members have filed plausible claims for compensation for exposure to Agent Orange on Okinawa. In some of the cases where Okinawa veterans have won their claims, the deciding factor has been testimonies — or “buddy statements” — from fellow service members. To collate such accounts and assist those exposed, the author has begun to collate such statements on his homepage . I was Tdy in Okinawa Kadena AFB 3 times: 1967-68-69. My job as an ACFT mech, entailed many duties: field maintenance, flight mech, tire shop mech. On several occasions we were ordered to spray a herbicide (defoliant) on the cracks of the flight line, fence lines and hangars without protective gear. Within a day of the spraying the weeds were dead. I was told it was agent orange. As of now I am a borderline diabetic, have heart disease. quadruple bypass and a mitro valve replacement. In addition to the spraying I was continually exposed to several now considered toxic and hazardous chemicals which left me with no or very little sensation in my fingers and my finger nails turned white. Some were Mek, jp4, hydraulic oil, acft cleaning solvents. When I applied to the VA I was told there was never any agent orange used in Okinawa. I need other vets who can verify that they sprayed defoliants also. New information suggests that Agent Orange was not the only – or the worst – defoliant sprayed on Okinawa. During the Vietnam War, the U.S. military used at least 12 different types of herbicides in southeast Asia to kill crops and destroy jungle where enemies could hide. Many of these defoliants were stored in barrels painted with colored stripes which identified their formulae and lent them their nicknames; for example Agent Orange, the most commonly-used defoliant. Another of these defoliants was Agent Pink. In 2003, the scientific journal, Nature, estimated Agent Pink contained dioxin at an average of 65.5 parts per million – a concentration of up to 22 times higher than Agent Orange.7 Researchers also revealed the Pentagon had ordered at least 464,000 liters of Agent Pink but the USAF only had records for spraying 50,000 liters; the remainder was missing. Now it appears that some of that Agent Pink found its way to Okinawa. Between 1975 and 1976, U.S. Marine Daniel Glanz was stationed on Camp Foster. During this time, he witnessed Marines and Okinawan base workers spraying herbicides around the barracks. Glanz also saw the barrel from which they filled their equipment. Glanz only realized the significance of what he had seen many years later when he heard about Caethe Goetz. Goetz, whose account was reported by The Japan Times in August 2011, was a Marine stationed at Camp Foster at the same time as Glanz.8 Sprayed with herbicides while walking on the base, she developed multiple myeloma which her doctors believed was a result of dioxin poisoning. Her children and grandchildren also developed illnesses associated with chemical exposure. As with so many other veterans, Goetz’s claims were denied by the U.S. government. She continued to campaign for the military to come clean about its usage of defoliants on Okinawa until her death in November 2012. 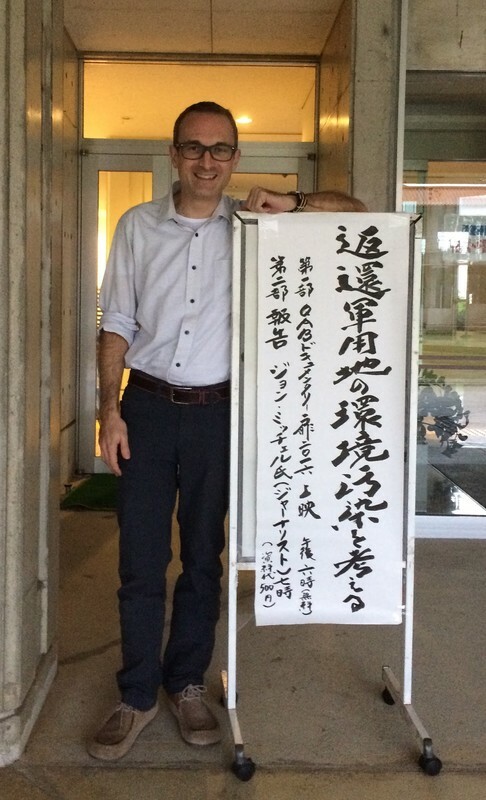 The author at Yomitan Village Hall where he lectured on military contamination. November 2016. An 8,700-page cache of military reports also obtained under FOIA reveals extensive ongoing contamination on Kadena Air Base, too.11 The documents show pollution from substances including PCBs, dioxin, PFOS, asbestos and lead. Alarmingly obvious in these Kadena Air Base reports is the negligence with which the military acted on the installation throughout much of the twentieth century. No records had been kept for the disposal of toxic PCBs – and possibly other hazardous substances – in the 1960s and ’70s. Moreover checks of on-base drinking water supplies were only conducted from one tap once a year until at least 1999. Lax safety standards at Kadena Air Base might now be returning to haunt the 20,000 USAF members and their families living and working on the installation. Jennifer Agger’s husband, John, spent a total of six years on Kadena Air Base, with his final tour ending in 2006. In 2014, at the age of 36, he died of pancreatic cancer. Determined to alert current service members stationed at Kadena Air Base of the risks, Jennifer took the post-mortem results to her congress member who contacted the USAF. Such opacity seems sadly all too common. Among the veterans I’ve interviewed during the past five years, three of them – including Goetz – have died waiting for the military to respond to their concerns or those of their families. Scott Parton, the shirtless Marine pictured in the now well-known photograph of a barrel of Agent Orange at Camp Schwab, died in April 2013. Gerald Mohler, a Marine exposed to herbicides near Camp Courtney, died in September 2013. US veterans were not the only ones exposed. It seems that Okinawan residents were also exposed. At Camp Schwab, high rates of cancers among employees have been attributed to the defoliants they were ordered to spray in the 1960s and ’70s. Given the persistence of dioxin below ground, it is unsurprising that the number of former military sites where it has been detected is rising. The soccer pitch in Okinawa City where 108 barrels were found. A residential area in Chatan. An old airfield in Yomitan. A shuttered military housing area at Nishi Futenma. Because SOFA does not allow checks within bases, nobody knows the extent of dioxin contamination on currently-operational U.S. installations. 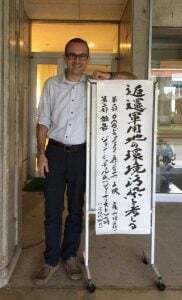 Likewise the Okinawa prefectural authorities and Japanese government have never conducted any epidemiological surveys of local residents or former military employees. In 2012, prefecture officials indicated they’d consider running health checks if firm evidence of contamination was ever found, she explains. This is a revised and expanded version of an article which appeared in The Japan Times on April 27, 2016. Jon Mitchell is a British Journalist and correspondent for Okinawa Times. He was awarded the Foreign Correspondents’ Club of Japan Freedom of the Press Award for Lifetime Achievement for his reporting about human rights issues – including military contamination – on Okinawa. 1Jon Mitchell, “US Military Defoliants on Okinawa: Agent Orange,” The Asia-Pacific Journal Vol 9, Issue 37 No 5, September 12, 2011. 2Jon Mitchell, « Okinawa Dumpsite Offers Proof of Agent Orange: Experts Say, » The Asia-Pacific Journal, Issue 38, No. 1, September 23, 2013. 3For example, see this Ryukyu Shimpo article – “Dioxin 21,000 times regular levels in Okinawa City barrel” – June 30, 2015. 4The author’s homepage maintains an updated list of veterans’ VA wins, including links to decisions to the Board of Veterans’ Appeals, can be found here. 5Jon Mitchell, « Vietnam: Okinawa’s Forgotten War« , The Asia-Pacific Journal, Vol. 13, Issue 15, No. 1, April 20, 2015. 6Jon Mitchell, « Herbicide Stockpile at Kadena Air Base, Okinawa: 1971 U.S. Army report on Agent Orange, » The Asia-Pacific Journal, Vol 11, Issue 1, No. 5, January 14, 2013. 7Jeanne Stellmanet al. “The extent and patterns of usage of Agent Orange and other herbicides in Vietnam,” Nature. Vol 422, 681. 8Jon Mitchell, “Okinawa vet blames cancer on defoliant,” The Japan Times, August 24, 2011. 9Jon Mitchell, « FOIA Documents Reveal Agent Orange Dioxin, Toxic Dumps, Fish Kills on Okinawa Base. Two Veterans Win Compensation, Many More Denied« , The Asia-Pacific Journal, Vol. 13, Issue 40, No. 1, October 5, 2015. 10For example, see “Mongooses near U.S. bases have high PCB levels,” Kyodo, August 19, 2013. 11Jon Mitchell, “Contamination at Largest US Air Force Base in Asia: Kadena, Okinawa”, The Asia-Pacific Journal, Vol. 14, Issue 9, No. 1, May 1 2016. 12Jon Mitchell, Tsuiseki: Okinawa no Karehazai (Tokyo, Japan: Koubunken, 2014). 13See also, Jon Mitchell, “Informed-Public Project seeks environmental justice on Okinawa,” The Japan Times, November 19, 2016.